To begin trading, launch the Aggregator instrument from the Configuration Manager by selecting the MDT w/ Leg Columns option. The Aggregator instrument pane is identical in function and display to MD Trader in the X_TRADER®. When an aggregated instrument is opened in MD Trader, the price and quantity ladder shows the aggregated data, and displays the bid and ask columns for the leg markets. An aggregated instrument can also be selected from the instrument explorer. Orders placed on the aggregated order ladder are routed to the aggregation server (e.g., AlgoSE-B). Routing is based on the predefined Joining and Taking routing options configured for that instrument. 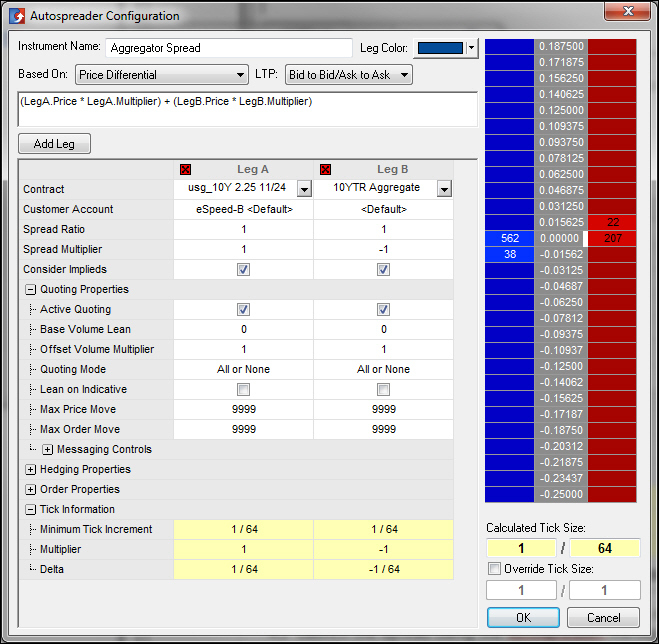 Use the Aggregated Instrument pane to trade the legs in the appropriate markets. However, Aggregator uses the parameters you set in the Aggregator Configuration dialog box to determine the prices at which the legs are traded. Whenever you trade an aggregated instrument, all working orders in the leg panes have a vertical color bar on the left side of the Working Quantity column. This color bar designates a working Aggregator order and uses the Leg Color ID you assigned to the aggregated instrument in the Aggregator Configuration dialog box. Note: Orders can be entered separately for the aggregated instrument and the individual legs. Orders submitted for the aggregated instrument also appear in MD Trader for each individual leg. You can view and trade your aggregated instruments in the Market Grid. To do so, launch or drag and drop your aggregated instrument from the Aggregator Manager window into the Market Window. You can trade your aggregated instruments using the Order Entry and Floating Order Entry panes. In addition, with the Top of Book color property enabled in the Properties | Colors tab, your aggregated orders will highlight when a working leg order is at the inside market. You can change customers for an Aggregator instrument in the Market Grid by using the Customer Selection List. When you highlight an Aggregator instrument spread in the Market Grid, any Order Entry features that do not apply are disabled. The market depth functionality in the Depth column in the Market Grid is disabled for rows containing Aggregator instruments. Selecting MD Trader from the Market Grid context menu will only launch the MD Trader for the Aggregator instrument and not the legs. To launch the instrument and leg orders, use the Aggregator Manager window. You can trade an Aggregator instrument in the Market Grid and enable and use Settings from the instrument’s MD Trader. 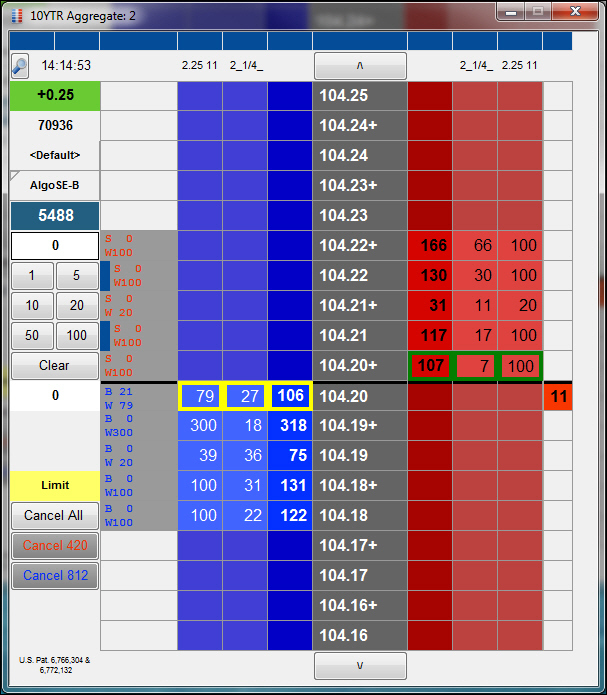 Your Aggregator orders appear in the Order Book, Fill Window, and Orders and Fills Window. To make it easy for you to find them, you can choose Aggregator as a filter in the Productcolumn. In addition, setting an account number for Aggregator orders in the Customer Defaults window lets you easily filter and view Aggregator working orders and fills based on a designated Aggregator account. The following table shows field values unique to Aggregator. Shows which Algo Strategy Engine (e.g., Algo SE-B) routed the order. Name of the aggregated instrument. Price of the working or filled aggregated instrument order. Quantity of aggregated instrument units in a pending state. For each leg, select instruments of the same product and tick size. The aggregated instrument must also be configured with the same instruments and tick size as the individual legs. Verify the tick information and implied market in the preview ladder, then click OK. Launch the spread using the Autospreader Manager dialog box using the Spread View. Orders for spreads with an aggregated instrument can be submitted using the MD Trader spread pane or Market Grid similar to other spread orders. The color bars and trade states for pending, working, or legged Autospreader orders are also the same. If a TT Gateway is not active when an Aggregator parent order is submitted, the order for the aggregated instruments will start on the AlgoSE server but wait for all TT Gateways to come up before submitting its child orders. If an active gateway becomes inactive or loses connectivity to the exchange after the child orders are submitted, the Aggregator parent order will pause and then cancel. This cancels all related child orders as well. X_TRADER® prevents you from submitting an Aggregator order if the market closes for one of the legs of an aggregated instrument. When a leg market closes, the closed exchange is expected to delete the GTD child order. When Aggregator sees the "external" delete, it logs a distinct message and looks for the first tradable leg to re-allocate the deleted quantity. If it finds no tradable legs (e.g., all legs closed at the same time) Aggregator waits until one or more legs become tradable then attempts to re-allocate the deleted quantity.